Oh my word, I’m just realizing there are less than 10 days until Christmas. WHAAAT?! I think I’ve been living in some sort of denial the last few weeks. December Denial? Anyway, I’m stepping out of the fog and darting straight into the kitchen, because I have ideas, ideas, ideas galore for the holiday season. So many yummy treats to make, and so little time. I had better get crackin’ around here! Things have been quiet here on FYB (heh, you know, “Feeding Your Beauty”), and that’s because I’ve been busy procrastinating important things, like taking some online courses and renewing my Rec Therapy certification. For some reason, when I’m procrastinating important things, I have a difficult time doing anything. It’s like guilt stops me from doing the projects I enjoy, like blogging and making goodies, but the motivation isn’t really there to do that Great Big Thing that I really need to get done. Well, over the last couple of days, I finished up my continuing education credits, and completed my online renewal application (all of which was incredibly painless) and I’m all squared away (hopefully) for another 5 years! Phew! I mean, it’s not like I had to do it right now, I had another 16 days until the deadline! I so could’ve put it off another few days. I’m kidding! It does feel so good to have it done and out of the way. Now on to the fun stuff! My recipe tonight is the yuletide version of my former obsession, the pumpkin vanilla chai steamed milk, which you may remember from October. After Thanksgiving, I began replacing pumpkin with some of my favorite flavors for the holidays: tingly peppermint, rich cocoa, warm cinnamon, and fragrant ginger. One of my favorite treats of the season is gingerbread cookies or gingersnaps! I absolutely love that molasses/ginger combination. It’s sweet with a spicy ginger kick. 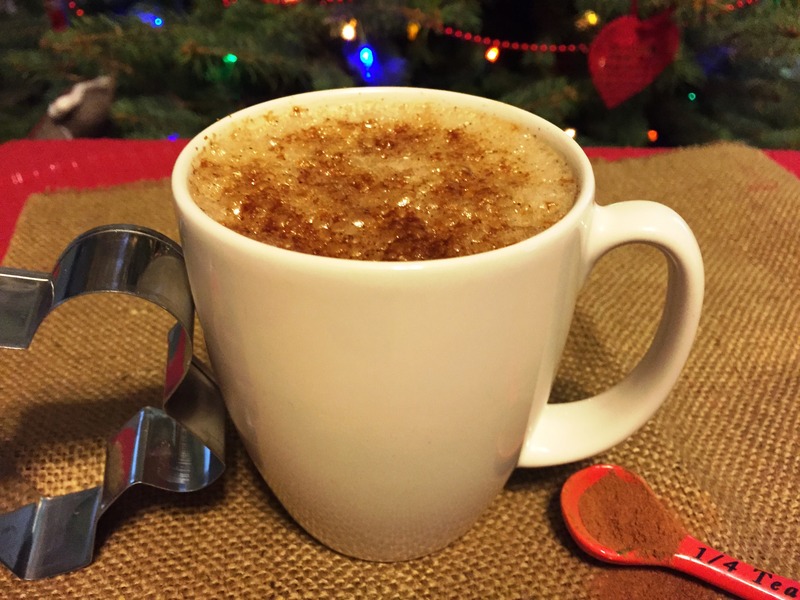 Just like my autumnal warm beverage, this gingerbread version is creamy, spicy, caffeine-free, and delicious. The ingredients are so simple, in fact the entire recipe is quite effortless. Although this is such a quick, easy, and uncomplicated beverage, I just had to share this idea with you all, because I’ve been making it every evening for the last week. I’m kind of hooked on it! Every evening I get out my little saucepan and gather my ingredients, mix them up, and gently warm them over the stovetop. It’s like a little ritual. I look forward to it every night. 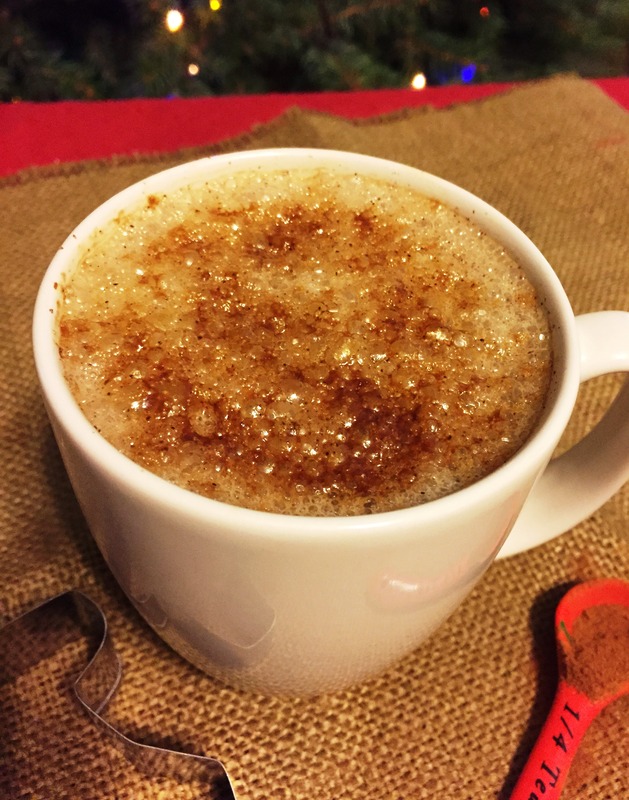 It’s the perfect way to relax and unwind after a long day of shopping, decorating, or baking, and the perfect beverage to sip while you fill out your holiday greeting cards. The real star of the recipe is the molasses. Did you know that one tablespoon of blackstrap molasses provides 20% of your daily recommended iron and calcium needs? 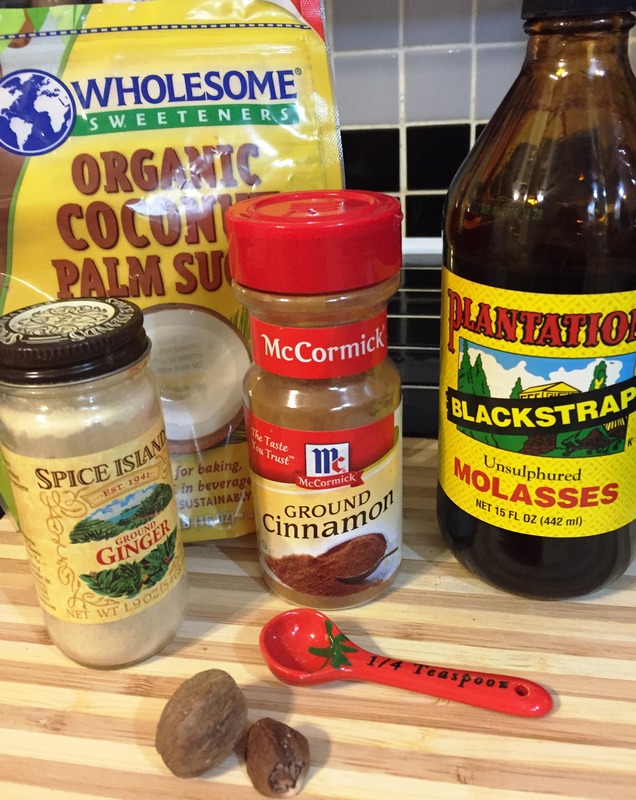 I know good ol’ blackstrap molasses doesn’t look too appetizing (looks a bit like motor oil, if you ask me), but it lends a yummy gingerbread flavor and it sure is a tasty way to get some calcium and iron in your diet. I’ve been working on this idea for a good while, in fact I first stumbled across an idea to heat molasses and milk together to make a drink about 5 years ago in a vegetarian cookbook. I tried it, and it was OK. It needed something. Something to make it taste like, well, something. Then I tried adding spices to make it taste like a gingersnap or gingerbread. That helped! It was close to what I was imagining. 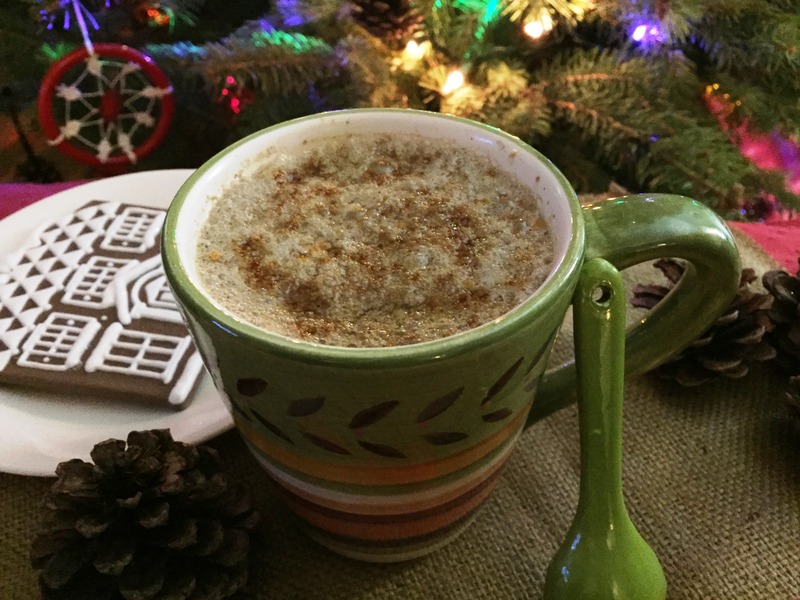 Last week I finally discovered the missing link, that special ingredient that took it from “It’s ok” to “Yup, I’m drinking a gingerbread cookie… and it’s fabulous.” The secret ingredient? Just a little bit of coconut sugar! It adds a depth of flavor and just a teensy bit of sweetness to offset the bold flavor of molasses. It also gives it more of a “cookie” flavor. Also important for this recipe: a creamy non-dairy milk. I’ve tried making it with just almond milk, and I’ve concluded it’s too thin to carry off the flavors. I would recommend trying cashew milk, or a combination of almond and soy milk (my personal favorite). Or how about the Cashew-Almond-Hazelnut Milk from last week? Now we’re talking! Combine all ingredients in a small saucepan over low heat. Stir well with a whisk. To make a foam on top of your beverage, whisk the milk very quickly as it heats. When it reaches the desired temperature, remove from heat and pour into mug. I like to sprinkle a pinch of coconut sugar, ginger, and cinnamon on top. Enjoy!